Your reporting helps Texas Parks & Wildlife manage healthy game populations to keep hunting great in Texas. Available Free on iOS and Android or online. No mobile device? You can also report your harvest through your web browser. 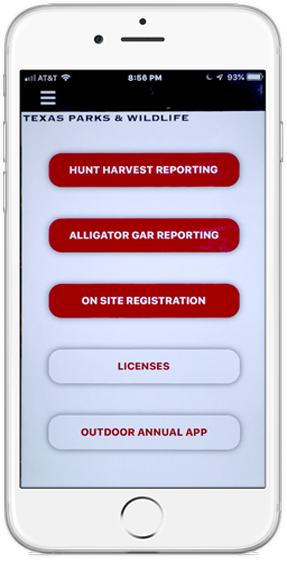 This app does not fulfill tagging requirements for completion of the harvest log on the back of the license, required for the harvest of both turkey and white-tailed deer. Thank You For Reporting Your Harvest!